Nashville, Tenn. (February 1, 2016) — Fans are finally able to get their hands on copies of Passion: Salvation's Tide Is Rising, now available in physical format after releasing digitally earlier this month. The album debuted at No. 3 on Billboard's Digital Albums Chart, No. 6 on Billboard's Top Albums Chart and made its seventh No. 1 debut on Billboard's Christian Albums Chart. Featuring Chris Tomlin, Crowder, Matt Redman, Christy Nockels, Kristian Stanfill, Melodie Malone, Brett Younker and Jimi Cravity, the worship anthems were introduced to more than 40,000 18-25 year olds at Passion 2016 conferences held in Houston and Atlanta arenas January 2-4. "...The entire album is spectacular"
"This year’s Passion album is one of the most impressive yet." "For years, the Passion movement has been ahead of the curve, delivering worship music that connects. With Passion: Salvation’s Tide Is Rising, listeners will find that this is still the case." "Passion has probably never sounded better to the ears." "Salvation’s Tide Is Rising, in a refreshingly simple way, takes us back to the roots of our hope in Christ; love, grace, surrender." "Easily the best Passion worship release in several years." 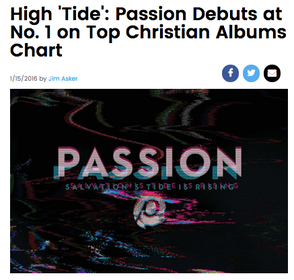 Media outlets such as Billboard, CCM Magazine and more continue to support Passion, touting the album's impressive chart placement. During Passion 2016, students donated $811,813 to help construct a hospital in war-torn Syria. Once completed, the hospital will serve 12,000 women and children each year and will offer one of the few neonatal intensive care units in the country. Also making an impact locally, students filled bins with thousands of towels and socks - two of the most needed items at homeless shelters - upon arrival at each Passion 2016 location. This year, Atlanta’s City of Refuge and Houston’s Star of Hope received the needed items.